Vacancies are available at Punjab Food Authority for 06 months Internship Program. Applications are invited for the following Positions. Masters or Bachelors or B.Sc Hons. Degree in Food Science and Technology, Agriculture Science / Food Safety and Quality Management, Food Nutrition and Science from HEC recognized University. BBA, B.Com, MBA degree from HEC Recognized University. Masters / Bachelors in Mass Communication from HEC Recognized University. Masters or Bachelors or B.Sc Hons. Degree in Food Science and Technology, Microbiology, Bio-Chemistry, Bio-Technology, Nutrition or Dairy Technology from HEC Recognized University. 02. 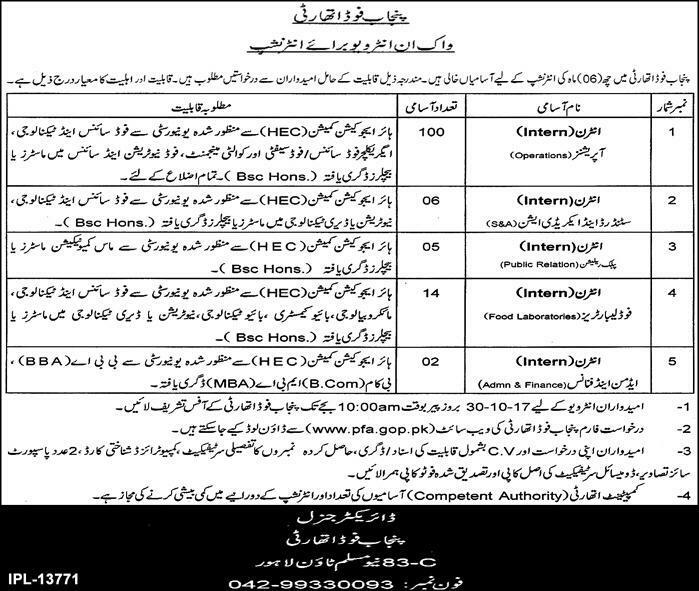 Interested candidates meeting criteria should appear for interview along with duly filled application form, detailed CV, original and attested copies of educational certificates, CNIC,Domicile and two recent passport size photographs at Director General Punjab Food Authority 83-C New Muslim Town Lahore. 03. Interviews will be held on October 30, 2017, from 10.00 am.